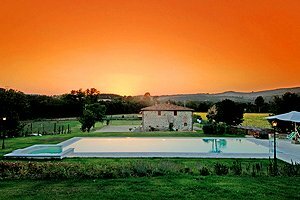 Our agency presents a wide range of villas in Val di Chiana , a fertile strip of land stretching in Tuscany, in the provinces of Arezzo and Siena, and in Umbria, in those of Perugia and Terni. And, above all, the region that has given birth to one of the most renowned dishes of Tuscan traditional cuisine: the famous steak! 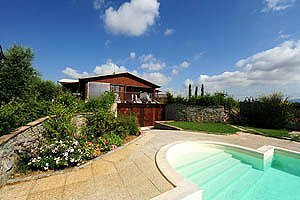 Maybe it is for this reason that most villas in Val di Chiana not only feature a swimming pool and a solarium area but also large green areas with the barbecue equipment and furnished for eating al fresco immersed in vineyards and olive groves. 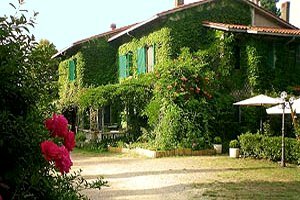 (either in the Aretine or Sienese part of the region) means spending a relaxing period in a villa , a cottage or a farmhouse provided with all modern comforts, featuring warm and cosy rooms furnished in rustic style (terracotta-tiled floors, red brick walls, pietra serena stairs and landings and beamed ceilings). And if your family has recently enlarged or if you want to take your trusty four leg friends with you... there is no problem! Just inform the owner of the lodging of your choice and at your arrival you will find anything you may need for your children and pets. 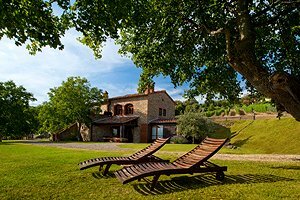 At this point all you have to do is browse our selection of villas in the Val di Chiana region and choose the ideal accommodation for your next holiday in Tuscany . 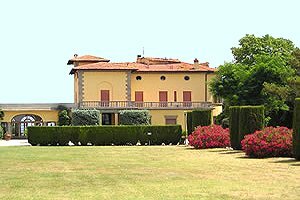 Aristocratic 19th-century luxury villa in Cortona, in Valdichiana, near Arezzo. 4/6/10 sleeping accommodations, swimming pool, wide garden, satellite TV, air conditioning, small animals admitted. Luxury villa dating back to the 16th century between Florence and Arezzo, in Upper Valdarno. Sleeps 12, swimming pool, Internet connection, barbecue. Perfect for holidays in Tuscany at the discovery of Valdichiana, Casentino and Chianti regions. Luxury villa in Cortona (Arezzo), in Valdichiana. 12 sleeping accommodations, swimming pool, wide garden, satellite TV, Internet connection. 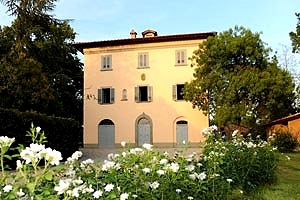 Luxurious villa (formerly a farmhouse) in Valdarno, in Bucine (Arezzo). Sleeps 10/14, wide garden, swimming pool, sauna, hydromassage, air conditioning, Internet connection. Riding stable, tennis courts, golf club and spas within a few kilometres. Tuscan luxury villa between Arezzo and Cortona, in Valdichiana. Sleeps 18+6, outdoor swimming pool, wide park, indoor swimming pool with hydromassage and sauna, air conditioning, Internet connection. Tennis courts, riding stable and golf club nearby. Ancient historic luxury villa in Valdichiana, in Montepulciano (Siena). Sleeps 16, wide garden, swimming pool, Internet connection, barbecue. Tennis courts, thermal baths, riding stable and golf club nearby. Elegant luxury villa situated in a historic site in the province of Siena, in Valdichiana. In the past an Etruscan site and then a medieval citadel, it affords magnificent views of the Tuscan countryside. Sleeps 14, wide park, swimming pool, sauna, Internet connection, air conditioning. Tennis club and thermal baths within a few kilometres. Beautiful 19-century villa in Valdichiana, a few kilometres from Cortona (Arezzo). Sleeps 9, swimming pool, Internet connection, air conditioning. Utmost privacy. Beautiful independent villa in Umbria, near the border with Tuscany and the town of Cortona (Arezzo). Sleeps 11, swimming pool, fenced garden, Internet connection, barbecue. Possibility of organising lunches and dinners at the property. Golf club within a few kilometres. Beautiful independent villa at the border between Tuscany and Umbria, near Monterchi (Arezzo), in Valtiberina. Sleeps 12, swimming pool, Internet connection, air conditioning, wine tasting. Possibility of organising dinners at the property. Beautiful villa on the hills around Arezzo, near Capolona, at the border between Casentino and Valdichiana. Sleeps 9, swimming pool, internal and external hydromassage, gym, steam bath, Internet connection, wood-burning oven, table-tennis and pool tables. Gorgeous panoramic views. Elegant villa near Sarteano (Siena), in Valdichiana. Sleeps 9, garden, swimming pool, Internet connection. A few kilometres from Val d'Orcia and the thermal baths of Chianciano Terme and San Casciano dei Bagni. The villa is part of vast estate including an 11th-century abbey. 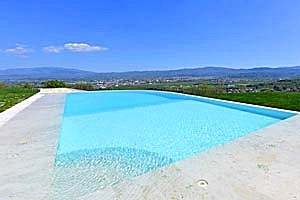 Luxurious villa with swimming pool for rent near Monterchi (Arezzo), in Valtiberina. Sleeps 8, Internet connection, air conditioning, wide garden, barbecue. Wonderful views of the surrounding hills. Guided tour of Valtiberina, guided tours of local wineries with wine tasting experiences. Welcoming small villa near Foiano della Chiana, a few kilometres from Arezzo, in Valdichiana. Sleeps 4+1, swimming pool, bicycles, garden swing, barbecue, fully fenced property. Golf club, riding stable, tennis club and outlet village nearby. 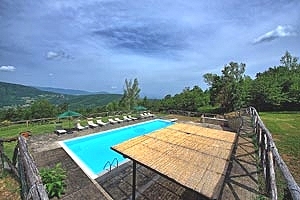 Villa with exclusive swimming pool in Valdichiana near Cortona (Arezzo). 10/11 sleeping accommodations, Internet connection. 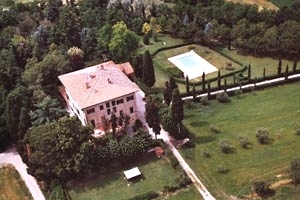 Villa with swimming pool between Sansepolcro and Monterchi, in Valtiberina (Arezzo). 8+4 sleeping accommodations, tennis court. Villa in Cortona, in Valdichiana, near Arezzo. 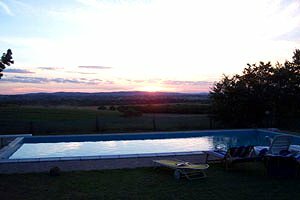 Farmhouse with swimming pool, 8 sleeping accommodations, wide garden, Internet connection. Villa in panoramic position on the hills near Terontola, in proximity to Cortona (Arezzo), in Valdichiana. 10+2 sleeping accommodations, swimming pool, garden, wood-burning oven, small gym, Internet connection. 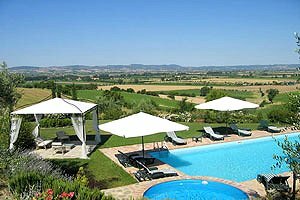 Villa with swimming pool near Montepulciano in the countryside of the Valdichiana between Siena and Arezzo. Sleeps8/10, air conditioning. Chiusi villa rental in Valdichiana near Siena. The villa is a calm and comfortable complex for a holiday getting in strait contact with nature. Swimming pool. 9 sleeping accommodations. Villa near Montepulciano (Siena) with magnificent view on the Valdichiana. Sleeps 10, private garden and swimming pool, air conditioning, Internet connection. Villa with swimming pool in Valdichiana near Lucignano (Arezzo). 10 sleeping accommodations, barbecue, wide garden. Villa ex-medieval sighting tower in Montecchio di Cortona, in Valdichiana, near Arezzo. 9 sleeping accommodations, wide garden, swimming pool, Finnish sauna, Internet connection, air conditioning. 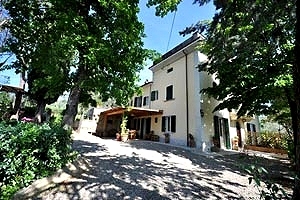 Villa in Valdichiana, just a few hundred metres from the small town of Lucignano ( Arezzo ). Sleeps 8, swimming pool, barbecue, Internet connection. Tennis courts, golf club, riding stable and thermal establishments within a few kilometres. Holiday villa near Cortona (Arezzo), in the Valdichiana. 6/10 sleeping accommodations, swimming pool, garden, air conditioning. Jogging, walking and mountain-bike routes in the neighbourhood. Villa near the small village of Sinalunga (Siena), in Valdichiana, between Montepulciano and Pienza. 14 sleeping accommodations, swimming pool, barbecue, satellite TV, wonderful panorama. Villa in Valdichiana, near Arezzo. 10/12 sleeping accommodations, swimming pool, garden, barbecue. Elegant 18th-century villa in Valdichiana, near Cortona and Chianciano Terme , in the province of Arezzo. 10/12 sleeping accommodations, swimming pool, Internet, barbecue, hydromassage, satellite TV, bicycles. Riding stable and tennis club in the neighbourhood. Elegant villa near Cortona (Arezzo), in Valdichiana. 10 sleeping accommodations, swimming pool, satellite TV, barbecue, Internet, hydromassage, small gym. Tennis and golf club and riding stable in the neighbourhood. 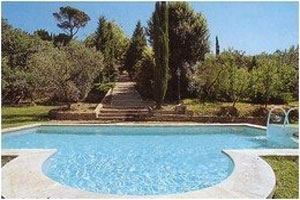 Villa with swimming pool for rent near Sarteano (Siena), in Valdichiana. Sleeps 14, beautiful private garden, satellite TV. Thermal baths within a few kilometres. Ideal lodging for relaxing holidays in the peaceful Tuscan countryside. Villa with outhouse for rent on the hillside of Mount Cetona, near San Casciano dei Bagni and a few dozen kilometres from Chianciano Terme (Siena), in Valdichiana. Sleeps 11, swimming pool, Internet connection, air conditioning, table-tennis table. Thermal baths within a few kilometres. Villa in Lucignano, in Valdichiana, at the border between the provinces of Siena and Arezzo. 12 sleeping accommodations, swimming pool, air conditioning, Internet connection. Ancient villa in Valdichiana, close to Cortona (Arezzo). 18+4 sleeping accommodations, swimming pool, Internet. Elegant ancient villa in the Val di Chiana, near Cortona (Arezzo). 6+2 sleeping accommodations, swimming pool, air conditioning, outdoor hydromassage, Internet connection, children's toys. Eighteenth-century villa in Civitella, in Valdichiana, in the province of Arezzo. 8/9 sleeping accommodations, wide garden, Internet connection. Breathtaking views over the surrounding countryside. 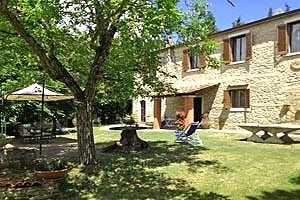 Holiday villa in Valdichiana countryside, in Cortona (Arezzo). 6 sleeping accommodations, swimming pool, Internet connection, air conditioning. 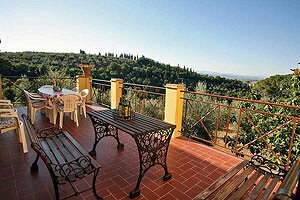 Holiday villa in Valdichiana, close to Cortona, in the province of Arezzo . 7 sleeping accommodations, swimming pool, private garden, barbecue. 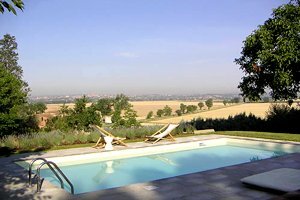 Former farmhouse converted into a villa with swimming pool in Valdichiana, near Montepulciano (Siena). Sleeps 14, wide garden, barbecue equipment. Thermal baths nearby. Villa with swimming pool near Cortona (Arezzo), in Valdichiana. 8 sleeping accommodations, garden, hydromassage, outdoor toys, air conditioning. Villa sleeping 5 in Valdichiana countryside, near Montepulciano (Siena). Garden, swimming pool, Internet connection, air conditioning, hydromassage, children`s playground. Tennis club, golf club, riding stable and spa resorts in the neighbourhood. Villa with pool in Valdichiana, near Cortona (Arezzo). Sleeps 6, garden, Internet connection, air conditioning, barbecue. Tennis club, golf club and riding stable nearby. Ancient farmhouse renovated and transformed into a villa in a farm with vineyards on the hills around Arezzo. Sleeps 10+2, swimming pool, wide garden, Internet connection. Riding stable and tennis club in the neighbourhood. Wonderful view over Arezzo. Ancient villa in Lucignano (Arezzo), in Valdichiana. Sleeps 18+4, wide garden, swimming pool, Internet connection, hydromassage. Spas, tennis club, riding stable and golf club nearby. Villa with swimming pool in Civitella in Val di Chiana (Arezzo), in Valdichiana. Sleeps 8+2, wide garden, Internet connection, barbecue equipment. Tennis club and outlet village within a few kilometres. Beautiful villa in Valdichiana countryside, between Arezzo and Cortona. Sleeps 14, swimming pool, wide garden, barbecue, Internet connection, air conditioning. 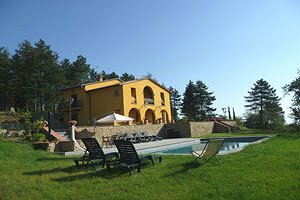 Villa with swimming pool in Monte San Savino in Valdichiana between Arezzo and Siena. Panoramic location and swimming pool. 10+2 beds. Panoramic villa in Valdichiana, in Castiglion Fiorentino (Arezzo). Sleeps 9+3, garden, swimming pool, air conditioning, Internet connection, children`s play ground, barbecue, wood-burning oven. Tennis courts, riding stable and golf club within a few kilometres. 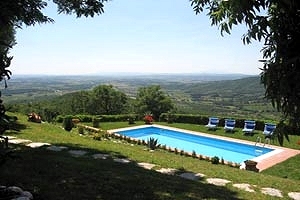 Villa with wonderful panoramic view over Valdichiana near the small town of Lucignano (Arezzo). Sleeps 12, swimming pool, Internet connection, barbecue. Tennis courts, riding stable, golf club and thermal establishments within a few kilometres. Villa in panoramic position on the hills of Valdichiana, near Chianciano Terme (Siena). Sleeps 10, garden, swimming pool, Internet connection. Important thermal towns nearby. Nice small villa on the hills that surround Cortona (Arezzo), in Valdichiana. Sleeps 4, fenced swimming pool, air conditioning, children's toys, barbecue. Lake Trasimeno within a few kilometres. 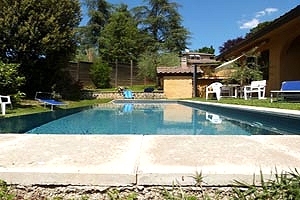 Small and charming villa with swimming pool in Valdichiana, near Cortona (Arezzo). Sleeps 7, garden, barbecue, Internet connection. Nice recently built villa a few kilometres from Cortona (Arezzo) and Lake Trasimeno. Sleeps 6+1, swimming pool, wide garden with solarium area, barbecue, Internet connection. Beautiful view of the lake and the surrounding countryside. Possibility of windsurfing, sailing and fishing. 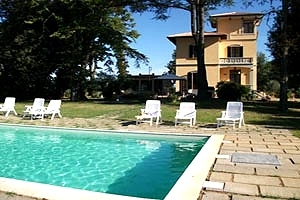 Villa with swimming pool in Valdichiana, near Monte San Savino (Arezzo). Sleeps 10, garden, barbecue, air conditioning, Internet connection. Tennis club and riding stable within a few kilometres. Villa in a very peaceful area of the Tuscan countryside, near Montepulciano (Siena), in Valdichiana, just a few kilometres from Lake Trasimeno. Sleeps 6+2, swimming pool, Internet connection, hydromassage, children`s playground. Elegant villa in panoramic location just a few kilometres from Cortona (Arezzo), in Valdichiana. Sleeps 8, swimming pool, wood-burning oven, table-tennis table, Internet connection, air conditioning. Beautiful independent villa in Valdichiana, between Arezzo and Cortona. Sleeps 9, garden, swimming pool, Internet connection. 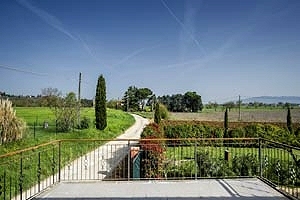 Panoramic terrace with charming view over the surrounding countryside. Possibility of organising dinners and Tuscan cooking lessons. 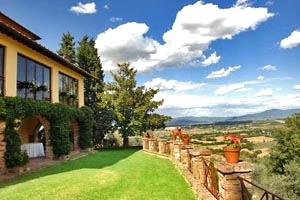 Beautiful villa atop a hill overlooking Arezzo and Valdichiana. Sleeps 8, swimming pool, whirlpool area, Internet connection, air conditioning. Possibility of organising wine, olive oil, spirits and balsamic vinegar tasting events. 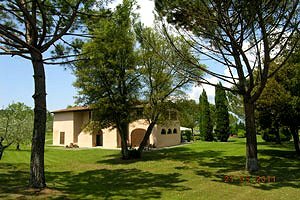 Beautiful modern villa on the hills of Valdichiana, at a short distance from Arezzo historic centre. Sleeps 8, swimming pool, Internet connection, hydromassage, wood-burning oven. Possibility of organising dinners and cooking lessons. 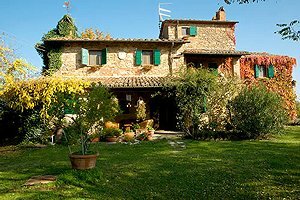 Charming independent villa on the hills around the Etruscan town of Cortona (Arezzo), in Valdichiana. Sleeps 4, swimming pool, barbecue, Internet connection, hydromassage, steam bath. Possibility of organising traditional Tuscan dinners. Cosy small stone villa part of a farm situated on the hills around Cortona (Arezzo). Sleeps 7, swimming pool, Internet connection, children's playground, table-tennis table. 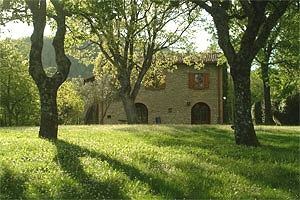 Villa with guesthouse near the historic town of Lucignano (Arezzo). Sleeps 12, swimming pool, Internet connection, barbecue. Wonderful views of the Valdichiana countryside. Riding stable and lake for fishing nearby. Possibility of organising cooking lessons, wine tasting events and tours of the neighbourhood. Beautiful independent villa in Siena countryside, near Montepulciano, in Valdichiana. Sleeps 6, swimming pool, hydromassage, Internet connection. Thermal baths within a few kilometres. Ancient country house in Castiglion Fiorentino (Arezzo), in Valdichiana. Sleeps 13, swimming pool, Internet connection, table-tennis table, wood-burning oven. Golf club, riding stable, outlet village and Lake Trasimeno within a few kilometres. Beautiful villa in the picturesque Tuscan countryside around Castiglion Fiorentino, near Cortona, in Valdichiana. Sleeps 14+1, swimming pool, Internet connection, hydromassage, private tennis court, table-tennis table, wood-burning oven. Golf club within a few kilometres. Villa in scenery location in Castiglion Fiorentino, between Arezzo and Cortona, in Valdichiana. Sleeps 9+2, swimming pool, private tennis court, Internet connection. Golf club within a few kilometres. Large villa for rent on the hills of Val d'Orcia, near Sarteano (Siena). Sleeps 16, wide garden, swimming pool, Internet connection, barbecue. Beautiful views of the surrounding countryside. Thermal resorts within a few kilometres. Charming villa in the province of Siena, near Sarteano, in Val d'Orcia. Sleeps 14, wide garden, swimming pool, Internet connection, barbecue. Thermal resorts within a few dozen kilometres. Utmost privacy. Nice small villa on the hills that surround the town of Cortona (Arezzo), in Valdichiana. Sleeps 6, swimming pool, children's toys, barbecue, air conditioning. Great views. A few kilometres from Lake Trasimeno. 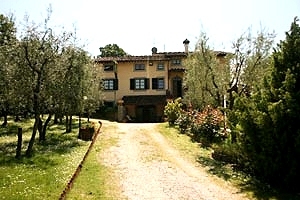 Elegant villa for holidays in Arezzo, in Valdichiana. 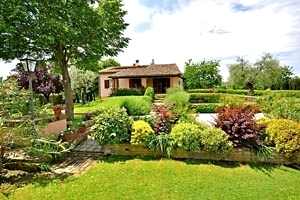 10 sleeping accommodations, swimming pool, air conditioning, Internet connection, satellite TV, breathtaking view of Arezzo. 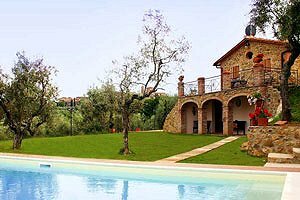 Beautiful villa in the countryside of Siena, just a few kilometres from Chianciano Terme thermal baths and the villages of Val d'Orcia. Sleeps 16, swimming pool, Internet connection, barbecue. 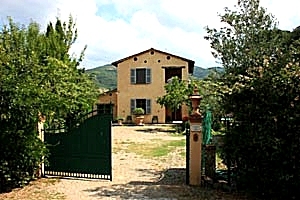 Farmhouse in the Tuscan countryside between Chianciano Terme and Orvieto close to Siena. 10+2 sleeping accommodations. Private swimming pool, satellite TV, parking. Animals admitted. Villa (formerly a farmhouse) in Rapolano Terme (Siena), in the Crete Senesi. Sleeps 9+2, panoramic position, swimming pool, Internet connection. Tennis courts, riding stable and thermal establishments within a few kilometres. Cosy apartment in a 20th-century villa on the hills north of Arezzo, in Valdichiana. Sleeps 6, wide garden, outdoor whirlpool bathtub, Internet connection. Possibility of organising cooking lessons and traditional Tuscan dinners. Apartment in villa on the hills around Cortona (Arezzo). Sleeps 7, swimming pool, fenced garden, air conditioning. Tennis club and golf club within a few kilometres of the property.